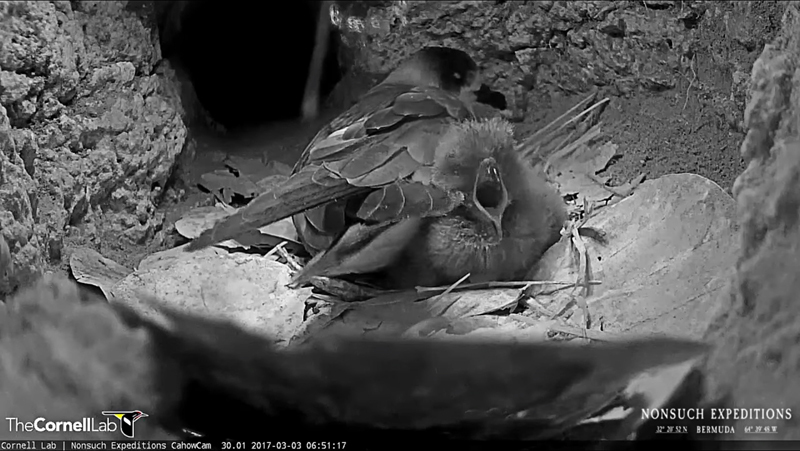 The Ministry of the Environment announced the safe arrival of a ‘CahowCam chick’ who broke out of his or her shell at 9:45 pm Thursday night. “Thanks to an extraordinary programme to safeguard the critically endangered Cahow by Senior Terrestrial Conservation Officer Jeremy Madeiros and the Department of Environment and Natural Resources team, this chick is one of approximately 60 who are expected to fledge during the 2017 breeding season,” a spokesperson said. “The CahowCam Project was initiated between the Department of Environment and Natural Resources and J.P. Rouja of LookBermuda in 2013 to address public outreach and education, one of the objectives of the Cahow Recovery Program. Nonsuch Island is too small, isolated and sensitive to accommodate large numbers of visitors. “Since Cornell University’s Lab of Ornithology became involved in January, CahowCam now reaches their million plus online followers. CahowCam has racked up 200, 000 views and 3 million minutes of viewing in 165 countries, bringing this Bermuda success story to the world. 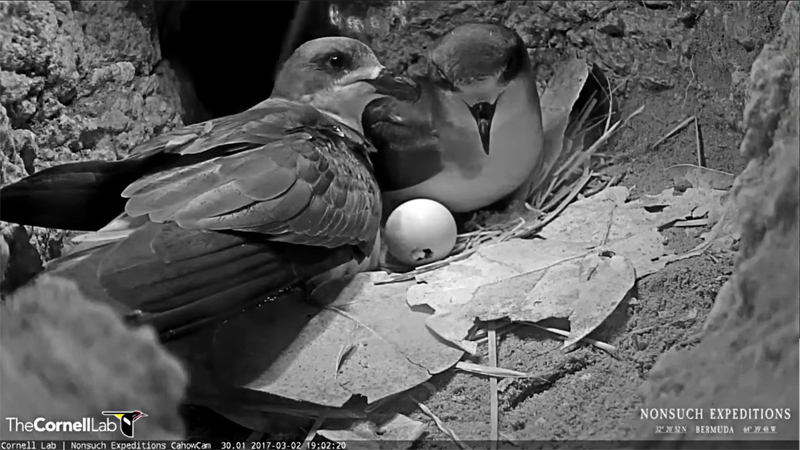 “LookBermuda/Nonsuch Expeditions’s innovative CahowCam uses infra-red photography so the birds are not disturbed. 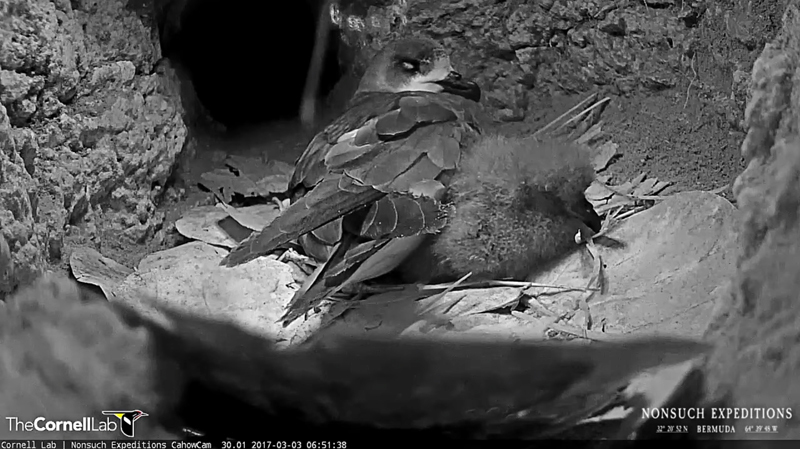 Ironically, visitors to CahowCam can actually see more than if they visited Nonsuch Island, as Cahows only fly in from the ocean and carry out courtship activity during the darkest nights, and are out of sight in underground burrows during the day. Minister of the Environment Sylvan Richards commented, “The Cahow or Bermuda Petrel population was in an incredibly fragile state. In fact, at one point, the cahow was thought to be extinct. “Dr David Wingate and Jeremy Madeiros worked tirelessly to nurture the few remaining breeding pairs. Their remarkable success has brought our national bird back from the brink of extinction. In 1960, there were only 17 breeding pairs and 7 or 8 chicks. This year there are 118 breeding pairs and hopes that 60 chicks will fledge, up from 56 last year. Jeremy Madeiros said, ”I must confess it makes me feel like something of a grandfather to this chick, having fed and cared for both of the parent birds when they were translocated to NonSuch from a nearby rocky outcropping 11 years ago, when they themselves were chicks. Charles Eldermir, Bird Cams Project Leader, Cornell Lab of Ornithology added, “Watching the hatching petrel I was struck by the distance we’ve come in such a short time for such an imperiled bird; to go from being only a memory to a rediscovered conservation touchstone in a matter of decades, and to share that story live with viewers from nearly every country in the world—what an incredible way to show that conservation is important and valued. All being well, 2017 CahowCam chick will fledge and fly out to sea with about 60 other fledglings in late May or early June.